Wilson Lourenco has recently published an interesting article where he discuss the evolution of scorpion venom and why some species are more dangerous to humans than others. The article also discuss the global distribution of dangerous species. 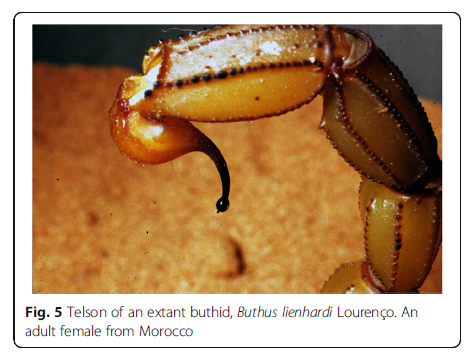 The article mainly focus on the family Buthidae, where we find most dangerous scorpions. The article is written in a popular science language making it interesting for both experts and laypersons. This contribution attempts to bring some general information on the evolution and, in particular, on the geographic distribution of scorpion species noxious to humans. Since 95% of the scorpions incidents are generated by specimens of the family Buthidae C. L. Koch, the analysis will be limited to this familial group. As in previous similar contributions, the content of this work is mostly addressed to non-specialists whose research embraces scorpions in several fields such as venom toxins and public health. Only in recent years, efforts have been made to create better links between ‘academic scorpion experts’ and other academic non-specialists who use scorpions in their research. Even if a larger progress can yet be expected from such exchanges, crossed information proved to be useful in most fields of scorpion studies. Since the taxonomy of scorpions is complex, misidentifications and even more serious errors concerning scorpion classification/ identification are often present in the general literature. Consequently, a precise knowledge of the distribution patterns presented by many scorpion groups and, in particular, those of infamous species, proves to be a key point in the interpretation of final results, leading to a better treatment of the problems caused by infamous scorpion species.